An unaltered photocopy of your: DD-214 or other military-issued document (along with your DD-214) clearly displaying your in-country Republic of Korea service after 27 July 1954. Personnel who serve in operations and exercises conducted in the area of eligibility are considered for the award as long as the basic time criteria are met. Due to the extensive time period for KDSM eligibility, the non-consecutive service period for eligibility remains cumulative throughout the entire period. RIBBON: Dark green represents the land of Korea, blue indicates overseas service and commitment to achieving peace. Gold denotes excellence, white symbolizes idealism and integrity. Description: A bronze-color disc bearing a Korean "circle dragon" within an encircling scroll inscribed "Korean Defense Service Medal" with, in base, two sprigs, laurel to dexter side, bamboo to sinister. Symbolism: The four-clawed dragon is a traditional symbol of Korea and represents intelligence and strength of purpose. The sprig of laurel denotes honorable endeavor and victory, the bamboo refers to the land of Korea. REVERSE: A representation of the land mass of Korea surmounted by two swords points up saltirewise within a circlet garnished of five points. Symbolism: The swords placed saltirewise over a map of Korea signify defense of freedom in that country and the readiness to engage in combat to that end. The circlet enclosing the device recalls the forms of five-petal symbols common in Korean armory. To amend title 10, United States Code, to provide for a Korean Defense Service Medal to be issued to members of the Armed Forces who participated in operations in Korea after the end of the Korean War. This Act may be cited as the Korean Defense Service Medal Act'. (1) More than 40,000 members of the United States Armed Forces have served on the Korean Peninsula each year since the signing of the cease-fire agreement in July 1953 ending the Korean War. (2) An estimated 1,200 members of the United States Armed Forces died as a direct result of their service in Korea since the cease-fire agreement in July 1953. SEC. 3. KOREAN DEFENSE SERVICE MEDAL. (a) The Secretary of the Army shall issue a campaign medal, to be known as the Korean Defense Service Medal, to each person who while a member of the Army served in the Republic of Korea or the waters adjacent thereto during the KDSM eligibility period and met the service requirements for the award of that medal prescribed under subsection (c). (b) In this section, the term KDSM eligibility period' means the period beginning on July 28, 1954, and ending on such date after the date of the enactment of this section as may be determined by the Secretary of Defense to be appropriate for terminating eligibility for the Korean Defense Service Medal. (c) The Secretary of the Army shall prescribe service requirements for eligibility for the Korean Defense Service Medal. Those requirements shall not be more stringent than the service requirements for award of the Armed Forces Expeditionary Medal for instances in which the award of that medal is authorized.'. 3754. Korean Defense Service Medal.'. (a) The Secretary of the Navy shall issue a campaign medal, to be known as the Korean Defense Service Medal, to each person who while a member of the Navy or Marine Corps served in the Republic of Korea or the waters adjacent thereto during the KDSM eligibility period and met the service requirements for the award of that medal prescribed under subsection (c). 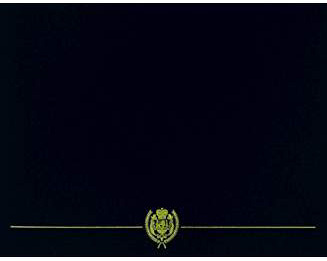 (c) The Secretary of the Navy shall prescribe service requirements for eligibility for the Korean Defense Service Medal. Those requirements shall not be more stringent than the service requirements for award of the Armed Forces Expeditionary Medal for instances in which the award of that medal is authorized.'. 6256. Korean Defense Service Medal.'. (a) The Secretary of the Air Force shall issue a campaign medal, to be known as the Korean Defense Service Medal, to each person who while a member of the Air Force served in the Republic of Korea or the waters adjacent thereto during the KDSM eligibility period and met the service requirements for the award of that medal prescribed under subsection (c). (c) The Secretary of the Air Force shall prescribe service requirements for eligibility for the Korean Defense Service Medal. Those requirements shall not be more stringent than the service requirements for award of the Armed Forces Expeditionary Medal for instances in which the award of that medal is authorized.'. 8754. Korean Defense Service Medal.'. 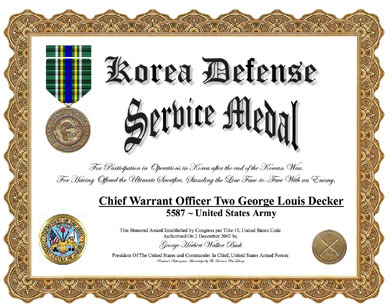 (d) AWARD FOR SERVICE BEFORE DATE OF ENACTMENT- The Secretary of the military department concerned shall take appropriate steps to provide in a timely manner for the issuance of the Korean Defense Service Medal, upon application therefor, to persons whose eligibility for that medal is by reason of service in the Republic of Korea or the waters adjacent thereto before the date of the enactment of this Act. 02 DEC 2002 WASHINGTON, D.C. President Bush today signed the National Defense Authorization Act, which among other things directs the Department of Defense to issue a Korean Defense Service Medal as championed by Congressman Elton Gallegly (R-Ventura County). The language signed by the President today comes from Galleglys Korean Defense Service Medal Act, which he introduced last year. The language specifically directs the DOD to award a Korean Defense Service Medal to members of the armed forces who served in Korea after July 1954, when the DOD stopped issuing the Korea Service Medal. The House and Senate voted to include the KDSM as part of the final version of the 2003 National Defense Authorization Act (H.R. 4546). Korean Defense Service Medal The Senate amendment contained a provision (sec. 532) that would require the service secretaries to issue a campaign medal, to be known as the Korean Defense Service Medal, to military personnel who served in the Republic of Korea, or the adjacent waters, between July 28, 1954, and a termination date determined by the Secretary of Defense, and who meet prescribed service requirements for eligibility. The House bill contained no similar provision. The House recedes with a technical amendment. The bill language recognizes the 40,000 servicemembers who have served in Korea since June 1953 and the 1,200 who have offered the ultimate sacrifice while serving there.